The more you tax of something, the less you get of it!!! Milton Friedman: Why soaking the rich won’t work. What Lesson Will Leftists Learn from another “Successful” Tax Increase? Back in August, I acknowledged that lifestyle leftists in California won a real victory. They imposed a tax on sugary soft drinks in Berkeley and achieved a reduction in consumption. But I pointed out that their success actually was an affirmation of supply-side economics, which is simply the common-sense principle that taxes impact behavior. Simply stated, the more you tax of something, the less you get of it. Which is why I’m constantly trying to get my leftist friends to be intellectually consistent. Even though I don’t think it’s the role of government to dictate our private behavior, I tell them that they are right about higher taxes on tobacco leading to less smoking (also more smuggling, but that’s a separate issue). 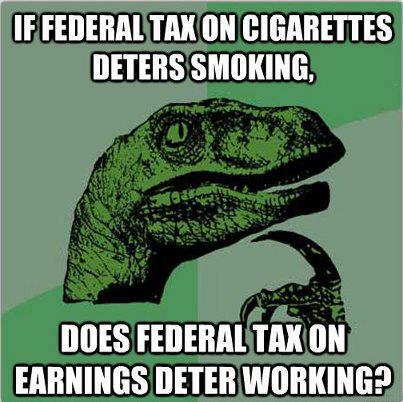 Yet these people simultaneously claim that higher tax rates on income (especially on the evil rich!) won’t lead to less work, saving, investment, and entrepreneurship. Maybe the disconnect is that leftists think tobacco and sugar are special cases. So let’s look at another example of a “successful” tax increase. Oct 4 Home sales in the Vancouver region’s heated housing market fell for the second consecutive month after the province introduced a tax on foreign home ownership, the Real Estate Board of Greater Vancouver said on Tuesday. In a statement, the board said September’s sales were at 2,253 homes, down 32.6 percent on a year-to-year basis and down 9.5 percent from August, the first full month after British Columbia announced a 15 percent tax on foreign buyers. Hmmm…., a tax gets imposed on X (in this case, housing) and the result in less X. What a shocking outcome! One week ago, I would have suggested that Hillary Clinton look at this story before moving forward with her plan for more class-warfare tax hikes. Given the surprising election outcome, I’ll suggest that Donald Trump look at this story before moving forward with his plan to boost the capital gains tax on “carried interest.” And he definitely should use this example to bolster support for the main features of his tax plan, particularly the lower corporate rate and death tax repeal. P.S. Even Barack Obama has endorsed the core principle of supply-side economics. FRIEDMAN FRIDAY Obama loves the death tax but listen to what Milton Friedman had to say about it!!! FRIEDMAN FRIDAY Dan Mitchell and Milton Friedman: Subsidies for Higher Education Are the Problem! FRIEDMAN FRIDAY Milton Friedman and Walter Williams have explained, minimum wage laws are especially harmful for blacks! FRIEDMAN FRIDAY Milton Friedman and Dan Mitchell look at the economics of medical care!! FRIEDMAN FRIDAY Milton Friedman has the two solutions to the Black Teenage Unemployment Problem!!! « Trump Administration’s Infrastructure Initiative should include more private-sector involvement!! !